STOP BY and ENTER at any of these preferred locations! Sweepstakes is open to all legal New York City tri-State (NY, NJ, CT) residents age 21 years and older. Any individuals (including but not limited to employees, consultants, independent contractors, and interns) who have, within the past six months, performed services for New York AM Radio LLC, (on behalf of WEPN-FM), Heineken USA Incorporated, any organizations responsible for sponsoring, fulfilling, administering, advertising or promoting the contest or supplying the prize, and their respective parent, subsidiary, affiliated and successor companies, and immediate family and household members of such individuals, are not eligible to enter or play. "Immediate family members" shall mean parents, step-parents, children, step-children, siblings, step-siblings, or spouses. "Household members" shall mean people who share the same residence at least three months a year. Entrants will additionally have the option to enter for a chance to win by writing the keyword, along with the entrant's name, address, phone number and e-mail address on a piece of paper and mailing it to ESPN New York, College Football In Your Home Tailgate Party, 125 West End Avenue, New York, NY 10023. Mail entries must be postmarked by December 29th, 2018 and must be received by January 4th, 2019. Limit one entry per person by either method. Multiple entries will be disqualified and will not improve chances of winning. Standard carrier text messaging and data fees may apply. By entering via text you grant Sponsor your consent to call or send a message to your cell phone should you be selected as a potential winner. Sponsor is not responsible for mail that is lost, stolen, late, illegible, incomplete, damaged, mutilated, misdirected, altered, tampered with or postage due. Winner will be selected at random, on or about January 4th, 2019. People or household members of people who have won any other prizes from WEPN-FM within 90 days of entry are not eligible to enter this contest. Any person who has won prizes of $600 or more within the last 6 months from WEPN-FM is ineligible to enter or win. Odds of winning depend upon the number of valid entries received. All other travel, meals, and any other expenses associated with this prize are the sole responsibility of the winner. Federal, state and local taxes are the sole responsibility of the winners, who will receive an IRS Form 1099 reflecting the final actual value of any prize valued at $600 or more. 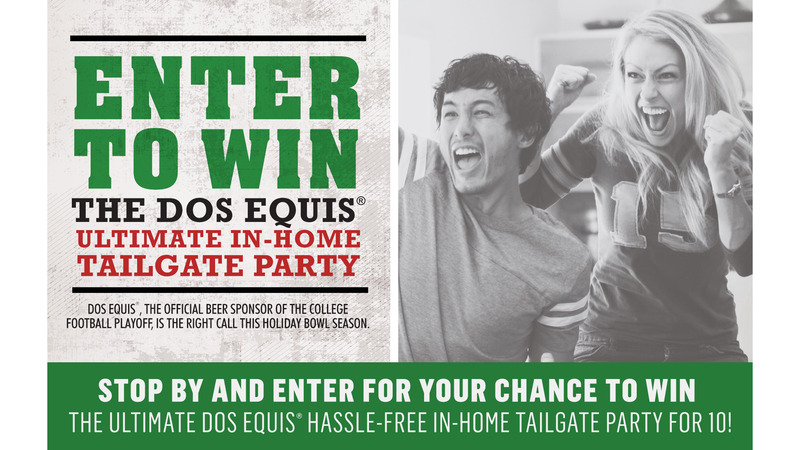 By participating in this sweepstakes and/or accepting any prize that they may win, entrants agree to release New York AM Radio LLC (on behalf of WEPN-FM), Dos Equis, Heineken USA Incorporated, Shoprite Stores (Wakefern Food Corporation. ), their respective parent, subsidiary, affiliated and successor companies, advertising and promotion agencies and prize suppliers, and each of their respective officers, directors, agents, representatives and employees, as well as each of their respective successors, representatives and assigns (collectively, the "Released Parties") from any and all actions, claims, injury, loss or damage arising in any manner, directly or indirectly, from participation in this sweepstakes and/or acceptance or use of the prize. 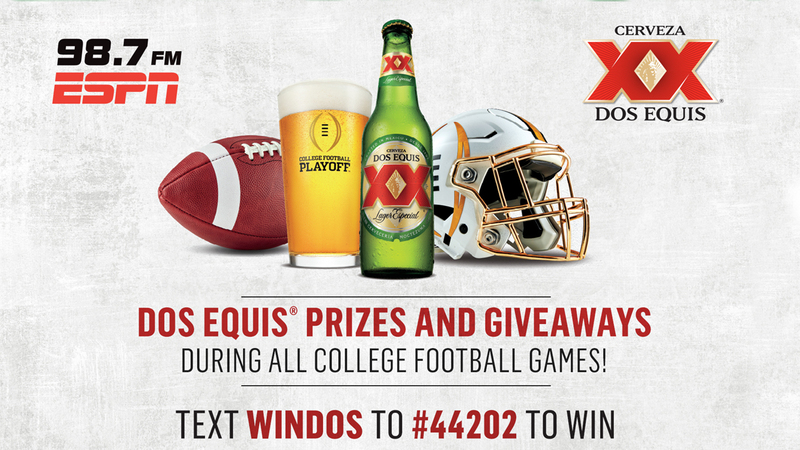 For a list of winners, send a self-addressed, stamped envelope to ESPN New York, Dos Equis In Your Home Tailgate Party, WEPN-FM 125 West End Avenue 6th FL, New York, NY 10023 within 60 days after sweepstakes end date.